The IPR welcomed academic researchers, policymakers and delegates to Pall Mall for a research symposium on widening participation in higher education. 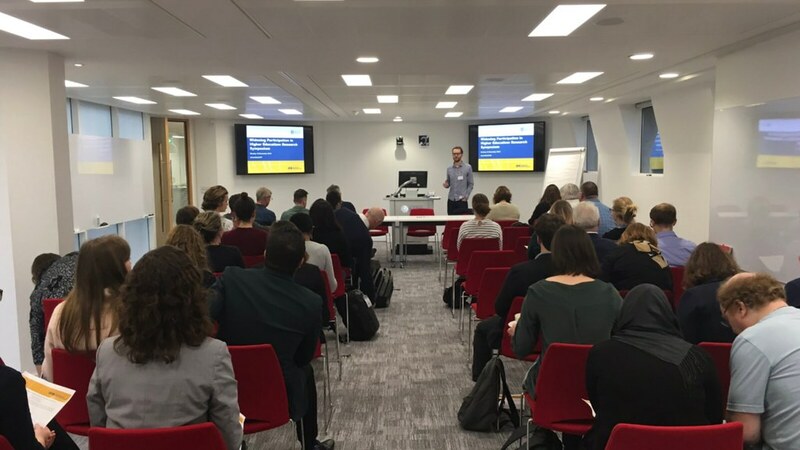 On Monday 12 November, the Institute for Policy Research (IPR) welcomed academic researchers, policymakers and delegates from a range of third sector organisations to Pall Mall for a research symposium on widening participation in higher education. The half-day symposium was held in Pall Mall, and featured a line-up of speakers including University of Bath academics, postgraduate researchers and representatives from the Department for Education and the Office for Students. IPR’s Dr Matt Dickson was first to take to the stage, welcoming delegates and introducing the key themes and objectives of the day. He also began the afternoon’s presentations, discussing his research on ‘Socio-economic Gradients in Graduate Earnings Outcomes’. Dr Michael Donnelly followed with a presentation on ‘Social Mobility in Elite Professions’ outlining his findings on graduate recruitment in leading finance, accountancy and consultancy firms. The final presentation of the first session was delivered by IPR Prize Fellow Dr Predrag Lažetić, looking at the values and opinions of higher education graduates in the UK and other European countries. Key findings included the fact that amongst the 35,000 postgraduates surveyed in this study, top indicators of job satisfaction were skill utilisation and work-life balance – not an increase in salary. After a quick break, the afternoon continued with short presentations from Natasha Hassall (Department for Education) on her Department’s work and priorities in widening participation, followed by Rebecca Wallbridge (Office for Students) who showcased their developing evidence and impact strategy aimed at driving improvements in access and participation in higher education. Attendees were left with at least one sobering fact – despite a commitment to research-based regulation, the Office for Students does not have access to academic research publications. University of Bath postgraduate researchers continued proceedings with their presentations on an array of fascinating research projects addressing a range of widening participation issues. Dr Leda Blackwood (Psychology) presented Lateesha Osbourne’s research ‘Existing with an Explanation: Black students’ experiences at a predominantly white institution’. This was followed by Jiedi Lei who’s currently conducting research on the social networks and support available to students with autism, when transitioning to university. Jo Davies (Education) next took to the stage for her presentation on ‘The Geographies of Access to Elite Universities’ which tied in nicely with Kostas Kollydas’ (Economics) presentation, ‘Exploring Inequalities in Non-Native Access to the UK Universities’. This was followed by Isabelle Schafer (Social and Policy Sciences) and her presentation, ‘Exploring the Role of Higher Education Institutions in the Integration of Forced Migrants in the UK’, in which she examined the experiences of forced migrants once enrolled in HE and the ongoing support available, concluding integration as a two-way process. Seren Essex (IPR/Architecture and Civil Engineering) delivered a compelling presentation on entry requirements for engineering degrees in the UK, asserting that subject requirements can potentially place unfair constraints on some applicants, leading to under-representation in certain groups. This was then followed by IPR PhD candidate, Jane Mackay (IPR/School of Management), who finished off the day’s presentations with her research on degree apprenticeships as a vehicle for widening participation. "We saw a range of widening participation research being undertaken at the University of Bath, both in terms of the different disciplinary approaches of the researchers involved and the aspects of the widening participation agenda being addressed. The findings and future plans demonstrated clearly how widening participation goes far beyond just getting people through the door and requires carefully thought-out policies to ensure that all students make the most of their HE experience and progress successfully through their degree, and are not limited by further hurdles as they move towards their post-graduate destinations." With great discussion set to continue in to the evening, Matt Dickson brought the afternoon’s proceedings to a close.